Augmented Reality (AR) provides customers the ability to supplement their real-world environment with elements that are ‘augmented’ such as video, graphics or even geo data. Used effectively AR allows users to interact and enhance their experience such as looking at a flat magazine advert for a building development and suddenly being able to navigate through the building. AR is here to stay and growing exponentially within the ever expanding mobile market, the key reason and drive is that augmented reality allows users to take the next step in integrating with the virtual or augmented reality world combining technology solutions with real life. Although AR its use is now widespread with games, retailers and real estate agents getting on board quick. Our main work at Appwriter is currently with real estate developers, helping them achieve higher levels of engagement and investors. 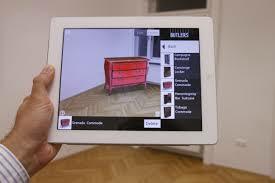 Presenting housing projects with augmented reality allows clients get to emerge themselves into the property on sale. Starting with a 2D picture an augmented reality app can produce a 3D creation of the property. It can then be viewed from different angles, cross sections of the house can be removed revealing layouts and more rich engaging content. Holding your mobile and moving it around creates a window into the property, allowing you to virtually walk around it and explore. This technology can also be used to show customers sky views from apartments and as well as internal look and feel changing wall colours and furniture allowing customer to virtually move in! Marketing studies have proven that when customers become more interest in a property that they viewed with an AR app, they often share on social media. Customers often like to ask the opinion of their family or friends and therefore quickly and easily share the listed property using our AR app. Obvious but very relevant, with everyone having a mobile AR apps are easily accessible, there is no easier way to reach potential buyers with all the information about apartments and houses for sale. Launch projects can be viewed anywhere with an interactive brochure. All you need is a mobile device with an app and a brochure of the company. Management information is key and engagement is now tangible and quantifiable through digital media statistics, times and places, length of each interaction and precisely which direct actions they took: booked a viewing, purchased, social shares, etc. This data creates a clear picture for the new projects within a company and how to maximise your ROI. So whether its retail, games or fashion Appwriter can deliver you amazing augmented reality app development, we can also create your 3D renders and trigger then as needed through flat brochure images or with dedicated targets. Interested in augmented reality development give us a shout!